I chose a selection of different items that took my fancy. 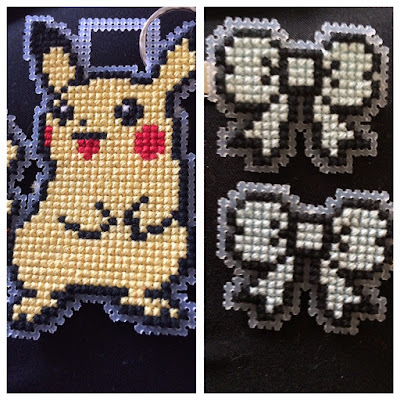 The first being a Pikachu cross stitched key chain. Does this need any further explanation? It's Pikachu and its on a cross stitch, what's not to love? It's pretty impressive quality, the edges are cut immaculately neat and it's all been done very well! I also got these very cute cross stitched hair bows. I almost died when I saw these in person, oh my gosh! They look so cute in my hair and they're pretty original - I've legit never seen these anywhere before. The bows themselves are secured very well onto the alligator clips. Anyone who knows me will know that I love a bit of Final Fantasy. I used to be absolutely obsessed with it when I was younger and amassed quite a lot of merchandise. So yeah, the Black Mage is cute and I got it on a little pin badge which I plan to attach to a plain black bag or something which will look super cute. Along with my package, Charlotte drew the cutest little Fluttershy drawing ever for me. She's such a sweetie. Be sure to check out her Twitter, Tumblr and Facebook. 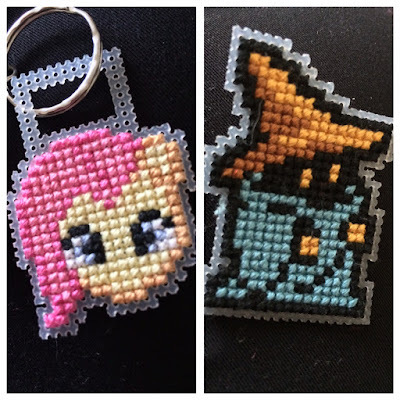 Definitely consider AmiGiftGift if you love anything cute and nerdy - I received my order within a few days and everything was very reasonably priced.